Last week, I was waiting for the bathroom to warm up and staring out the window at the chicken coop, where one hen was scratching outside of bounds. At first, the sight was a little confusing. I wasn’t sure what that girl was doing, though I could see her and was sure I shouldn’t be able to because I don’t actually have xray vision and can’t see through chicken coops. The people of the chickens say there’s one who shouts, “PAPILLON!” and goes over the wall all the time, so: okay. Then I took a shower. It was a good and thorough shower in which I lathered my entire epidermis, later slathering it with moisturizing goo, making me feel rather well. Then I looked out the window again and discovered two more chickens going on the lam. 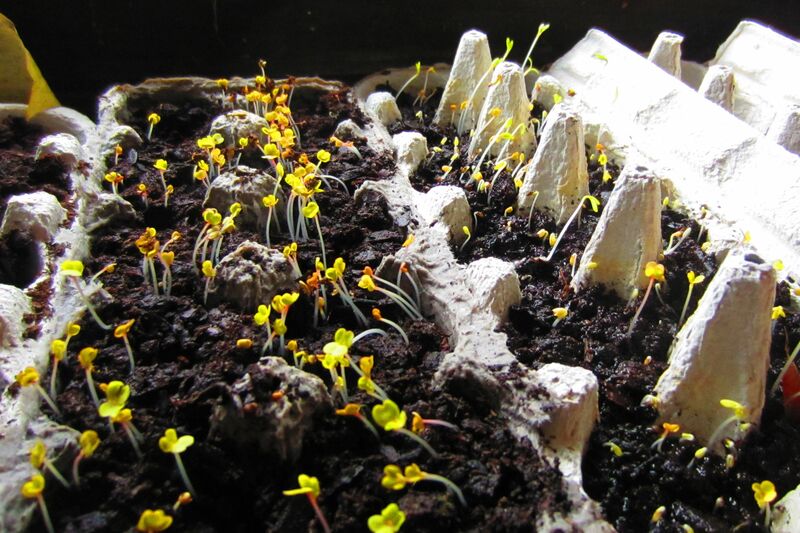 The first wave of seeds have sprouted just in time for me to go back to work. It is so inconvenient to have to make a living at the time when flora comes to life. I called my sister Anya. Anya: Hey! What’s up? That thing you said on Facebook was SO FUNNY when pronounced in the original Middle English! Tata: I have to tell you a thing. Tata: I do. It is this: the chickens are loose. Anya: Is that code for something? Tata: No. The chickens are actually loose. Anya: By that, do you mean they are badly assembled? Tata: Nope. You know your friend I don’t speak to? Call her and tell her her chickens are loose and making a break for it. You might want to hurry. About five minutes later, She Who Is Not the Boss Of Me ran down her back steps and wrangled some hens, while I returned to my cramped schedule of smelling great and admiring my luminous, soft skin. Because I am so awesome. This entry was posted in This Never Happened To Pablo Picasso and tagged plants. Bookmark the permalink.